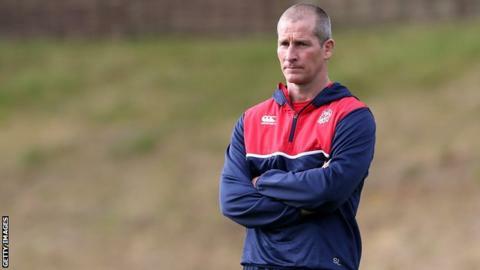 England head coach Stuart Lancaster is refusing to be distracted by talk about his future before the must-win game against Australia on Saturday. But he said if England failed to get out of the group stages the "accountability lies with me". England's 28-25 defeat by Wales on Saturday left his team third in Pool A. They now face the prospect of becoming the first host nation not to reach the knockout stage of a World Cup if they are beaten by the Wallabies. "I will not go beyond this game," Lancaster, 45, said. "There a lot of things to play out in the next two weeks, I have to concentrate on getting the team in the right place for what is a massive game. "At this level you cannot think about the past or what will happen in the future. If you start getting distracted by the 'what ifs' then you are not doing your job." Lancaster has a contract with the Rugby Football Union until 2020, which will take him through until the next World Cup in Japan in 2019. He attracted criticism from former players and coaches, including Will Carling and Sir Clive Woodward, after the defeat by Wales which came after England had led 22-12 with 30 minutes left at Twickenham. "It is a must-win game because if we don't qualify from the group there is no hiding," Lancaster said. "Everyone understands where the responsibility and accountability lies and that's with me."